The functions on the SwissTool can be opened from the outside and the functions got independent springs to avoid clumping. The locking mechanism is a metal plate operated by a spring with the release button on both sides. It is normal to find some play in the lock. It is smart to sharpen the blades from time to time and remember that a sharp knife is a safe knife. From time to time I give a stripe of oil across the functions and move them into closed and locked mode. The stripe of oil will then get into the friction parts and this will secure the best functionality. If much dirt and substances develop in the locking mechanism then I use warm soapy water and a plastic brush. I clean everything inside and clean every function independently. I like the mechanism to move free and this secures the functionality. After soapy water I rinse much and move the functions. After this I give the tool some oil. This SwissTool is used much and i will clean the whole tool today to remove the little dirt on it. I like the multittool clean. The SwissTool is now cleaned. Remember to clean the pouch or sheath too because dirt or sand can influence the tool. 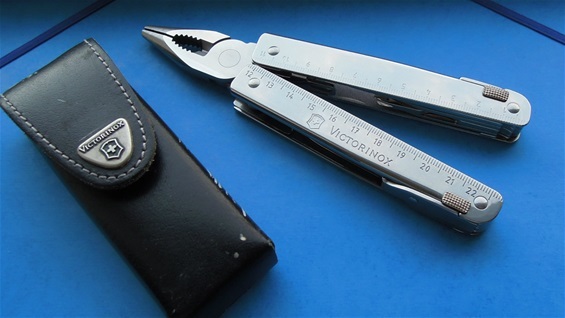 The only detail on the SwissTool pliers that could be better is the length of the cutting area. It is a bit short for some tasks. If you are cutting electrical cables with some size then you may need to cut two times for one cable and this does not make a clean cut. You can use the knife and cut it but this is not the best either. 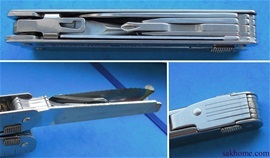 The plier itself and cut area on the SwissTool got many variations and it got development in design and functionality. Still I feel the cutting part could be increased even more. When you have been into knives for many years you will read the construction with functions and how versatile it can be. There is one very big advantage with the construction on the Swisstool. With this it is possible to use the metal file/saw for example towards a surface better. If you do not hold the hand or fingers under the handle and just grip then you see with the lines how close you can get to a flat surface. The advantage with this is when you must cut a device that is barely reachable.